To access the photo gallery click here. For news and repercussion click here. 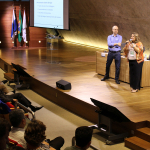 On November 30th, the students approved in the selection process of Entrance Exam 2018 and their families were present at the ceremony, which took place at the FGV Cultural Center. The opening was conducted by the Deputy Director of Teaching and Management of Undergraduation, Professor André Villela. Then, the ceremony was attended by the Director of FGV EPGE, Professor Rubens Penha Cysne, the Coordinator of the Center for the Training and Development of Careers (NEDC), Beralda Lima and the Coordinator of the Pedagogical Support Unit (NAP), Helena Giolito and EPGE students.